Posted on September 12, 2015 by MD Posted in News . International Peace Day will be hosted at the Peace Village, Messines, Belgium, where local school children will kick off a series of football games with Peace Poppy Footballs. The footballs will then be distributed to International Children’s Football Alliance projects around the world helping to create peace-makers for the future. The Peace Poppy Football will also help kick start the Heritage Lottery Funded Peace Field Project where schools in England research their World War Heritage through sport; commemorating the war and celebrating peace. 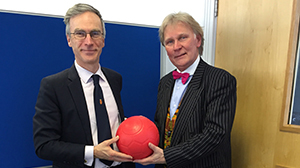 Andrew Murrison, MP, The Prime Minister’s Representative for the First World War Centenary (left) & John Carmichael, International Children’s Football Alliance, NED (right) holding the Peace Field Poppy Ball which is due to kick off on International Peace Day, Monday 21st September, 2015, at the Peace Village, Messines, Belgium.